Jon Spencer sheds his backing Blues Explosion, sharpens his fangs and bites down through meat and bone to get his teeth into twelve of his tastiest trash blues morsels to date. On Jon Spencer’s debut solo outing, he’s trimmed whatever little fat there was on his trash blues garage sound and focused himself like never before to come out with what could well be his best album to date. 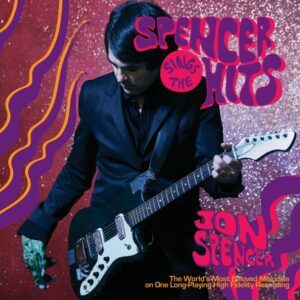 A tall order indeed when considering the quality he was churning out around the time of Acme and the Blues Explosion’s triumphant return to form after their hiatus with Meat + Bone, but his new album, Spencer Sings The Hits, is definitely up there with them. Kicking proceedings off with lead single Do The Trash Can it’s clear that, although this is his first solo LP, there is no way he’s going to set about fixing a wheel that ain’t broken. It’s a stomping mash of pounding distorted blasts under radio static vocals. Exactly what we’ve come to expect from New York’s king of trash blues. Simple, to the point, and raging in a fuzzed up ball of energy. It’s a sound that he employs again and again throughout the record, sometimes pushing it to the fore, such as on the funky Overload, while other times using it to prop up a song from within like on the sultry and slinking reverb soaked Love Handle. On Ghost he pushes it even more to crank up a definite spooky octave guitar sound. Fuzz is no doubt the order of the day, as with many of Spencer’s songs, but on …The Hits he serves it up in more varied doses and intensity to create an album that keeps you hooked from start to finish. Fake and Beetle Boots are great volleys against everything phoney, the latter turning its accusatory eye on wannabe musicians. Everyone wants to be in a band. Everyone wants to rock, to roll, but it’s all forgery and imitation. It’s a scathing attack on the probably many unknown bands that he has seen fall by the wayside throughout his career, an perhaps on sopme of those who were propelled further up on the back of his ripped-to-shreds coattails. Closer Cape sees him dropping a definite Cramps influence but new single I Got The Hits is a definite standout on the album. The song slides along on a funky garage groove, rising and falling through catchy verses and choruses and it deserves to be a floor-filler in booze-soaked dive bars the world over. On his debut album, Spencer is not peddling anything new and there’s nothing on the record that would jump out and surprise anyone who has heard even one of his songs, but what he has in abundance on this record is quality. Over 33 minutes he slams his primeval fuzzed out trash garage blues sound to pieces…beautifully!